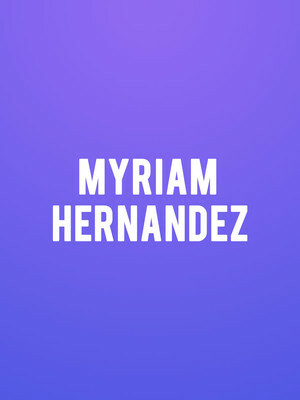 Known as the Queen of Latin American romantic ballads, Myriam Raquel Hernandez Navarro began her stellar career at the age of 11 when she debuted her first track 'Ay Amor' on the popular Chilean TV porgram Generacion Joven. Her relationship with both the small screen and music continued to blossom when she landed roles on beloved soap opera and TV presenting stints whilst simultaneously releasing music with EMI records. In 1988, her debut self-titled album hit quadruple platinum in multiple countries including the US, solidifying her status as Spanish language pop royalty. Whilst sweet melodies and tender lyrics about love lost, won and the passionate tumult that lies in between remain at the core of her writing, Hernandez has re-invented herself in recent years by experimenting with a range of different genres like hip hop, dance and electronic music. Don't miss this chance to see a living legend celebrate a storied musical legacy when she steps out on stage this winter. Sound good to you? Share this page on social media and let your friends know about Myriam Hernandez at NYCB Theatre at Westbury. Please note: The term NYCB Theatre at Westbury and/or Myriam Hernandez as well as all associated graphics, logos, and/or other trademarks, tradenames or copyrights are the property of the NYCB Theatre at Westbury and/or Myriam Hernandez and are used herein for factual descriptive purposes only. We are in no way associated with or authorized by the NYCB Theatre at Westbury and/or Myriam Hernandez and neither that entity nor any of its affiliates have licensed or endorsed us to sell tickets, goods and or services in conjunction with their events.